". Agricultural drought is a climatic excursion involving a shortage of precipitation sufficient to adversely affect crop production or range productivity." Drought in the Great Plains is based on the material presented at the NATO Advanced Study Institute on droughts held in Lisbon, Portugal. The participants tackled diversified problems reflecting concern with droughts but also in a broader sense with aridity, water shortage and desertification. The presented material was compiled into a cohesive unit, including past as well as ongoing concerns about coping with droughts. 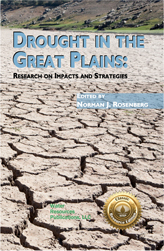 The book provides an integrated framework around some central themes related to efforts needed to cope with or manage droughts. The entire book is organized around three basic subjects. The first part, Introduction, sets up the general interface between drought, environment and society. It delineates some general characteristics of problems of water shortage and desertification, and provides an overview of the socio-economic, political and environmental impacts of droughts. In part two, a number of general problems are raised concerning the range of feasible responses and mitigation efforts to drought impacts. In addition to broad drought control strategies, two major emphases consist of either supply oriented measures or demand oriented measures in meeting the challenges of copying with drought impacts. A specific case is made for managing environmental aspects of agricultural droughts. The final chapter attempts to bring together nonstructural measures, with the institutional adjustments and modifications needed in droughts. Part three reflects concern with drought case studies, including risk management cases, as well as long-term planning and anticipatory management of drought. 4. Strategies and Measures for Coping with Droughts.